Learning: Everyone should be a student and anyone can be a teacher; learning embraces personal development, knowledge and skills; learning changes people, inspires action and opens new worlds; we encourage the creation of a learning environment in which people are able to reflect and grow; there are many inspirations that can offer opportunities for learning. Expanding Jewish Horizons: We strive to create individual, collective and communal experiences, through which we strengthen and develop our Jewish identity. Enabling Connections: We aim to create opportunities for communities and individuals to connect; we recognize the strength of providing a space where spiritual, emotional and intellectual connections are made. Participation: Volunteerism is a key feature of almost everything we do; we are all responsible for each other and for the communities we create – everyone has an important contribution to make; we encourage participants to take an active part in all we do. Empowerment: We inspire people to be ambitious about their contribution; we challenge people, and trust them to rise to that challenge; we see the potential of individuals and communities, and support their development; we empower people to make choices and provide the information they need to inform those choices (including biographies we ask presenters to provide). Diversity: We value the rich diversity among Jews, and so we seek to create cross-communal and inter-generational experiences; we value accessibility, and aim to be accessible to all; we value choice in form, content and style in our programs; we encourage people not to stereotype others. 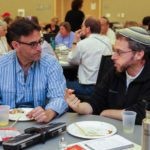 Community and Mutual Responsibility: Limmud is a community of learning; we can achieve more together than we can individually; we gain from, and should give something back to, the Jewish and wider community. Respect: No-one is more important than anyone else; we expect all participants to be respectful of one another, recognizing that all volunteers are also participants; personal attacks are not acceptable in any Limmud context, especially within sessions at events. Arguments for the Sake of Heaven: We recognize and appreciate that ‘arguments for the sake of heaven can make a positive contribution to furthering our education and understanding; we do not participate in legitimizing or de-legitimizing any religious or political position found in the worldwide Jewish community. Anyone coming to Limmud seeking opportunities for this will not find them. We have no part to play in the debates between/across denominations. Sessions which encourage vigorous debate are entirely acceptable, but we will seek to avoid religious or political conflict. Sessions should be educational, not polemical. Religious Observance: Shabbat (from the Hebrew word meaning “Sabbath”) and kashrut (a set of Jewish dietary laws) are observed in all public areas; we recognize that in private areas, people will behave as they wish. Should participants wish to hold a prayer group, they may do so, providing they supply all resources and are responsible for the session or prayer group in its entirety. Sustainability: Investing in the people who make up that community; ongoing financial stability; minimizing our environmental impact.